stickman's corral: Torres on football clubs: "Romance is dead"
And, of course, the World Cup in South Africa was, to use the local vernacular, ama-ZING. I only went to one stadium game*, but was right in the heart of the action for most of the tournament. The fanwalk area around Cape Town Stadium was always epic, as was the general vibe in the whole country at the time. I'm really stoked that I got the chance to go back for that. Fernando Torres dismissed accusations of disloyalty over his controversial move from Liverpool to Chelsea yesterday by declaring that "romance is dead" in football when it comes to players sticking with their clubs and said he did not have the time to wait for Liverpool to rebuild. In a frank and revealing press briefing, Torres said that he simply ran out of patience with Liverpool and feared that he would miss out on collecting the domestic trophies that so many of his Spain World Cup-winning team-mates have. He denied the allegations of hypocrisy over his previous protestations of loyalty to Liverpool by claiming that the only club he really loved was his childhood side, Atletico Madrid. With the likelihood that he will start, Torres said that he would not celebrate if he scored against his former side but that was the only concession to sentimentality he made. He disagreed with accusations that he was a traitor, saying that he had given Liverpool three and a half good seasons as well as generating the club a major profit. 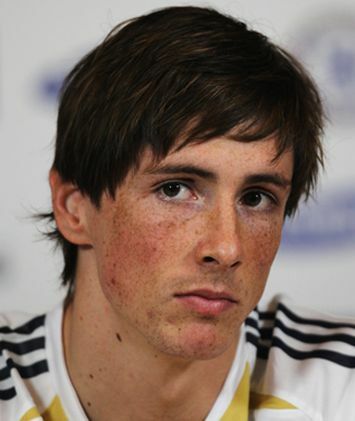 Torres said: "I see some players doing that [kissing the badge] when they join a club, but the romance in football has gone. It's a different thing now. People [players] are coming and leaving. When you are joining a club you want to do the best for yourself and that club, and that's all. Some people like to kiss the badge. They can do it. I only want to score goals and do my job, and achieve all the targets the team has. "I took the decision to leave Liverpool because I heard about Chelsea's interest. They were pushing hard, which means they really wanted me. I really wanted to leave Liverpool, so I told them straight. Everything was clear. At the end of the day, it's about being fair and honest with everyone." The top players expect to be surrounded by peers and management of similar calibre. If Liverpool couldn't provide that to a guy like Torres (indeed, they dismissed some of their best players in the last two seasons), what rights do they think they have in playing the loyalty card? THOUGHT FOR THE DAY: The surest way to get someone to act like clown is to start treating them like they're in circus. Those who don't buy into the show can - and probably will - leave. ** Sometimes I truly think that the salary caps in rugby (in places such as England) are a good thing. It seems inevitable to me that football will blow up in ever-expanding bubble of unsustainable salaries and dangerously debt-financed clubs. In a related note, here is the ever-provocative Bill Maher on what "makes NFL football so great" (spoiler: "socialism"): Irritable Bowl Syndrome. If you can't watch the clip, here is a text version.